My husband and I raised our 5 children to believe that a girl could do anything a boy could do and vice versa. While we preached the message – I admit we didn’t always lead by example. When we set up housekeeping in the early 80s, we attempted to establish an equitable, well-defined division of labor. Especially in domestic areas such as housecleaning and raising kids. Rejecting all sexist notions of “women’s work” and “men’s work,” I introduced what I refer to as the Passion Scale. My personally devised system for determining who should do what. The Passion Scale is quite simple. It merely suggests that the marital partner who cares the most, on a scale of 1-10, about a particular chore/task/issue should be the one to handle it. For instance, if I’m at a “3” about the overflowing trash can (I barely noticed it) and you are at an “8” (it’s driving you crazy) then YOU are probably taking out the trash. Because you are more “passionate” about trash disposal. By allocating each responsibility to the partner who cares the most about a particular matter, you effectively make it their bailiwick. This sounds like a foolproof and flawless plan right? It’s true – The more you care, the more you do. I know some people with this problem. They permanently exist at about a “9” or a “10” in all matters, while their mate hovers below a “4” on everything. Consequently, they do all the dirty work. Thankfully, that’s not a problem in my marriage. As the years flew by, my hubby and I both stepped up to the plate to perform the tasks we each cared the most about. Our problem is we have crippled one another’s ability to perform any duties that fall under our own umbrella. As you can see with just a precursory glance at this list, despite my efforts, our responsibilities ended up leaning towards a predictable gender-bias. Apparently, men care about men-stuff and women care about women-stuff. Last night my Honey was packing for a business trip and asked me to fold his shirts. He lavished praise, maintaining that he is astounded by the speed and efficacy of my shirt folding skills. Reminding me constantly that if things don’t work out with my writing, I can always work at The Gap or Banana Republic. Flattered beyond measure, I attempted to teach him my method for folding shirts. (Hold shirt with front facing you, gripping at the shoulder seams. In one swift movement, whip the sides to the back while simultaneously bringing the collar to the hem.) He attempted to perform this maneuver over and over, failing miserably. I kept explaining that it’s “all in the wrists,” but he couldn’t seem to master the technique. 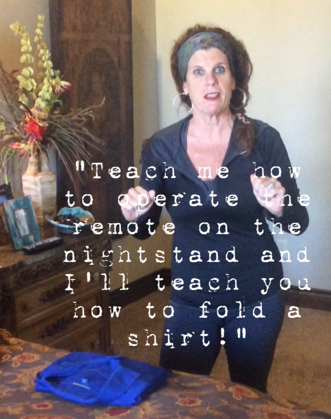 It didn’t matter – because after I demonstrated it several times, I had managed to fold every shirt he needed for his trip. After all, I shouldn’t need a man every time I want to watch a little television, plus he was about to leave town. On a Passion Scale of 1-10, I was at a “9” or a “10” about watching TV. So after a few tries, I eventually (sort’ve) understood the operational intricacies of our remote. Because marriage IS NEVER a competition, we are NOT keeping score. But I think I might’ve won last night. I can watch TV with or without my husband now, but he can’t ever leave me, because he would need me to help him pack. I love this. I still don’t know how to use the remote. I guess I better get a lesson from my husband. Thanks for the great commentary on marriage and chores. Good luck learning how to work your remote. Ours has about 100 different buttons. Ridiculous! Thanks for reading and commenting!! I was thinking if they filmed a tutorial, we’d always have the instructions on our phones!! That is damn cute. Sent to my friends. “It’s all in the wrist!” Haha. I figured out how to work the remote. The one for the regular Direct TV with the primetime channels on it. My problem happens when I want to watch HULU, or HBO-GO, or Netflix! That is a whole seperate remote….the “smart hub” remote…..! This is where trouble begins……! I know! There is NO WAY I would attempt Netflix! I just want to watch This Is Us on regular network tv! No Mam!! I CAN NOT fold a fitted sheet. Pottery Barn actually has a video where this girl demonstrates how to fold a fitted sheet. I clicked on it and watched. It was soooo complicated. I thought, “life is too short!” and exited outta there. I just sort’ve ball fitted sheets up!